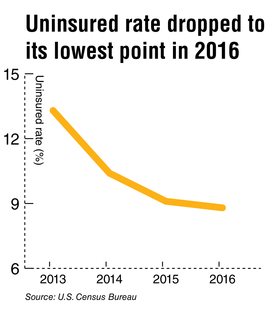 The number of people without health insurance continued to fall in 2016, according to new data from the U.S. Census Bureau. Last year, 28.1 million people, or 8.8% of the U.S. population, were uninsured for the entire calendar year, down from 29 million people, or 9.1% of the population in 2015. Before the Affordable Care Act was implemented, about 41.8 million people, or 13.3% of Americans, were uninsured in 2013. The uninsured rate has decreased ever year since then. The ACA helped lower the uninsured rate by ushering in new health insurance requirements and expanding eligibility for coverage. For instance, it allowed young adults up to age 26 to stay on their parents' health insurance plans and required most people to enroll in coverage or pay a financial penalty. The law also allowed states to expand Medicaid eligibility to people with incomes up to 138% of the poverty level. By Jan. 1, 2016, 30 states opted to expand Medicaid. In those states, the uninsured rate was lower than in states that chose not to expand Medicaid, the census data released Tuesday showed. About 67.5% of those with insurance coverage were privately insured in 2016, while 37.3% were enrolled in government programs. 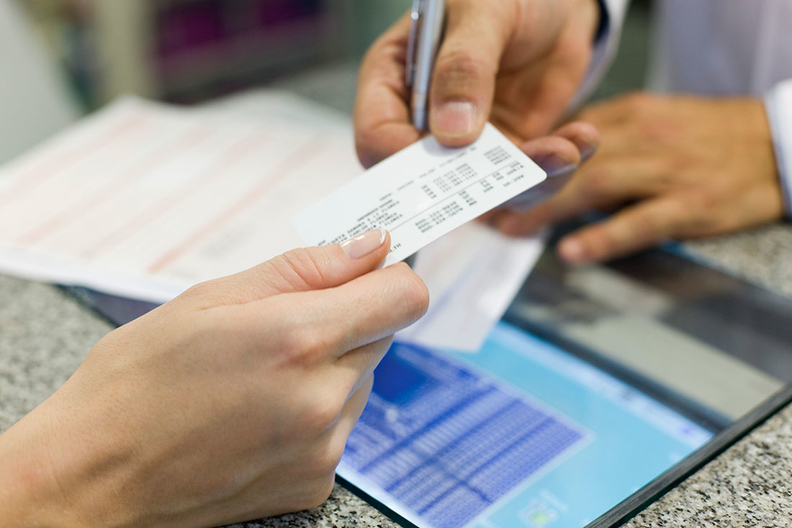 Privately insured individuals get coverage through an employer or union, or buy it directly from an insurer or through a health insurance exchange. Government programs include Medicare, Medicaid, the Children's Health Insurance Program, state health plans, Tricare and others. Job-based insurance continued to be the most common source of coverage. According to the data, 55.7% of people get insurance from their employers, while 19.4% are covered by Medicaid and 16.7% by Medicare. The data also showed that 16.2% of people buy insurance directly from a health plan or through an exchange, and 4.6% of insured people have military-based coverage. The number of people covered by Medicare grew by 0.4% from 2015 to 2016, while the percentage of people covered by other types of insurance remained essentially unchanged. White people had the lowest uninsured rate of any ethnicity at 6.3%. Meanwhile, 10.5% of black people and 7.6% of Asians were uninsured. Hispanics had the highest uninsured rate at 16% in 2016. The data also showed that adults over age 65 and children under age 19 were more likely to have health insurance than working-age adults. That's because seniors are likely to be covered by a government plan, like Medicare, and children from lower-income families may be eligible for CHIP, the Census Bureau explained. Uninsured rates varied videly between states. During 2016, Massachusetts had the lowest uninsured rate at 2.5%, while Texas had the highest at 16.6%. The Census Bureau said 25 states and D.C. had uninsured rates at or below 8%, and seven states had uninsured rates of 5% or less. Alaska and Texas were the only states with uninsured rates above 14%.